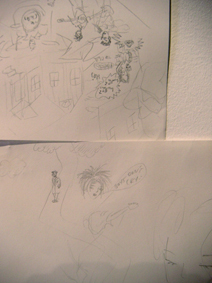 The drawing of two houses surrounded by a forest was moved from the outer eastern wall to the western wall, below the cut-out drawing of a house with three people in a kitchen (one of them playing a guitar). 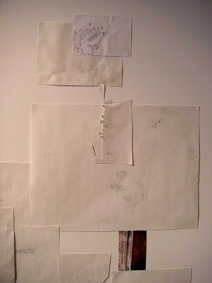 The photograph of a lego-house was placed beneath the drawing of the forest, touching the ground. 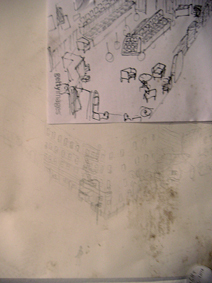 The drawing of a group of people in shops and restaurants (including one named "Gandhi") was placed overlapping the drawing of several different concerts (taking place at both the Bowery Ballroom, Trädgårn and on a pier). 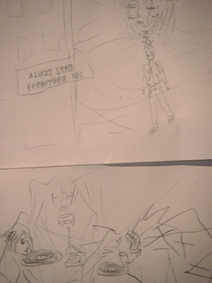 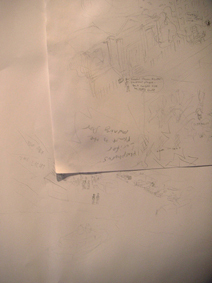 The drawing of some figures in a forest-like landscape with two buildings (one a circular one in brick) with the band Sonic Youth playing in the skies above was cut apart into three sections. 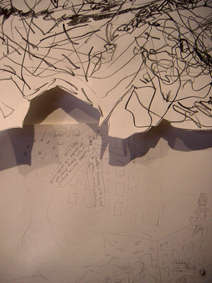 One section, depicting the forest and the circular building, was placed above the drawing of the two buildings and the forest (connecting it with the drawing of the "Gandhi" restaurant). 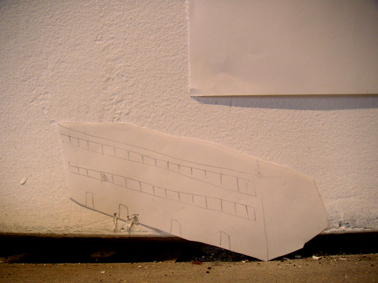 The other section (a building with two figures) was placed low on the wall, touching the floor, underneath the cut-out drawing of a house with three people in a kitchen. 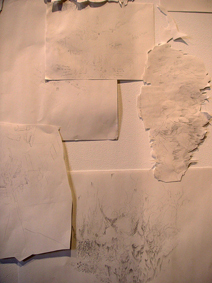 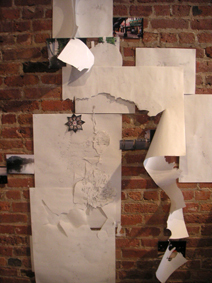 The drawing of a figure in a kitchen (sitting with a laptop with the word-balloon reading "We formed a band" coming out of it), four groups of bands and a large grapevine was removed from the inner eastern wall and placed overlapping the cut-out drawing of a rehearsal-space on the western wall. 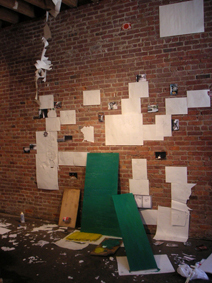 The drawing of a walking figure and the word-balloon reading "Boys don't cry" was also moved from the inner eastern wall and placed on the western one, attached to the lower right-hand corner of the drawing of several figures around a cafe (Vox Pop). 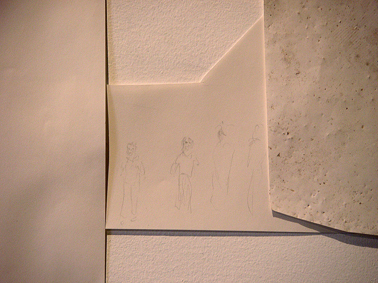 Next to this drawing of a walking figure a cut-out fragment of another drawing (featuring some buildings, a boat going under a bridge, a figure and a moon), which had previously been placed on the outer eastern wall, was hung, connecting it with the drawing of a large group of people in an apartment. 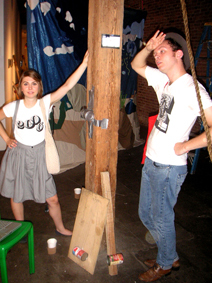 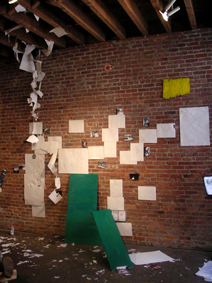 The drawing of a figure standing outside of a record store (Sound Fix) and the drawing of the interior of a record store were removed from the floor by the inner eastern wall and placed on the western wall above the cut-out drawing of a band (Jens Lekman) performing a song with the lyrics "You are the light". 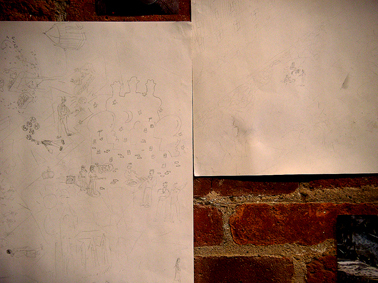 On the outer eastern wall the drawing of a figure in a park by a building with a statue in front of it and some word-balloons reading "There's another Lincoln statue by the same sculptor in Prospect Park" and "Where Lincoln once stood now Gandhi stands", was placed underneath the drawing of several angels and other figures, as well as a chalice and a house. 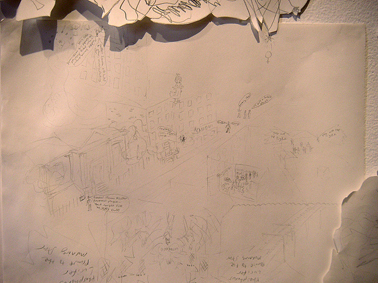 A fragment of the cut-apart drawing of some figures and buildings in a forest landscape with the band Sonic Youth playing in the skies above was placed underneath the cut-out drawing of a band rehearsing on the moon. 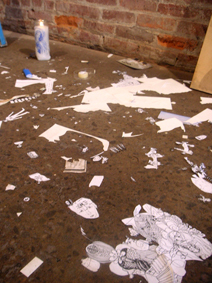 The fragment depicted the band Sonic Youth performing. 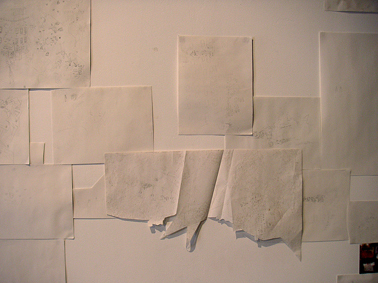 The drawing of some figures listening to records in record stores, as well as some figures picnicing, was moved so that it was placed along the upper edge of one of the green sheets of wood. 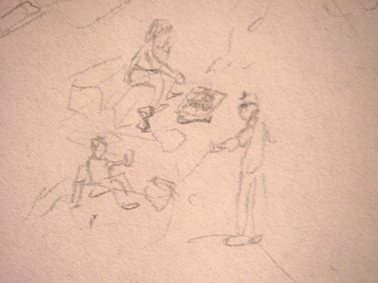 The drawing of three figures barbequeing on a mountainside was moved from the floor by the inner eastern wall and placed to the right of the drawing of the figures in record stores. 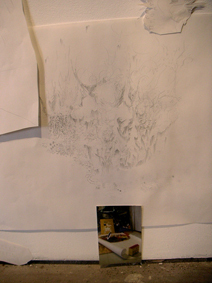 Beneath this was placed a photograph of a plastic snowflake, which previously had been laying on the floor by the outer eastern wall. 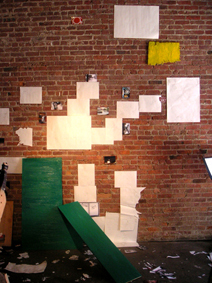 The wooden board which had been painted yellow was placed on the western wall. 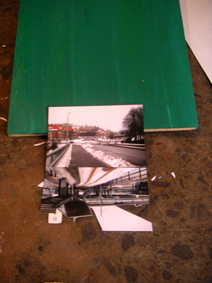 The two photographs depicting a couple of bridges, which had been placed on the floor leaning against the outer eastern wall, were placed on the edge of one of the green boards. 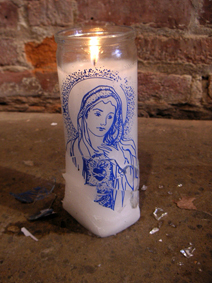 A Virgin Mary candle, which had been found outside the gallery and placed by the outer eastern wall, was lighted. 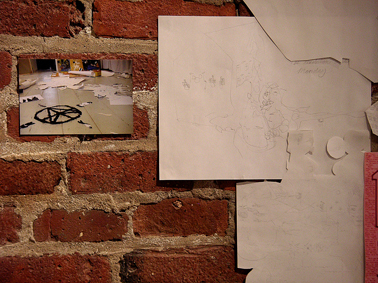 The photograph of a combinded "peace" and "anarchy" sign, done on a floor in coffeegrinds, was placed on the inner eastern wall, to the left of the drawing of some instruments in a building and the text "The revolution starts on monday". 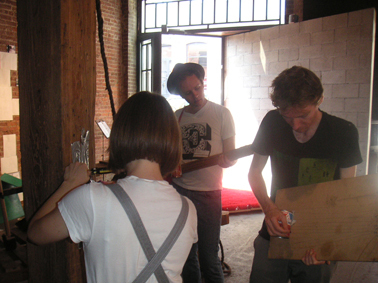 A concert consisting of two short improvsed pieces (Light 1 & Light 2) was performed in the gallery by Jens Lekman, Terese Nordström and Hampus Pettersson using the instruments which had been built there.